Upload file with data by clicking on button or by drag and drop, is the topic of this article. 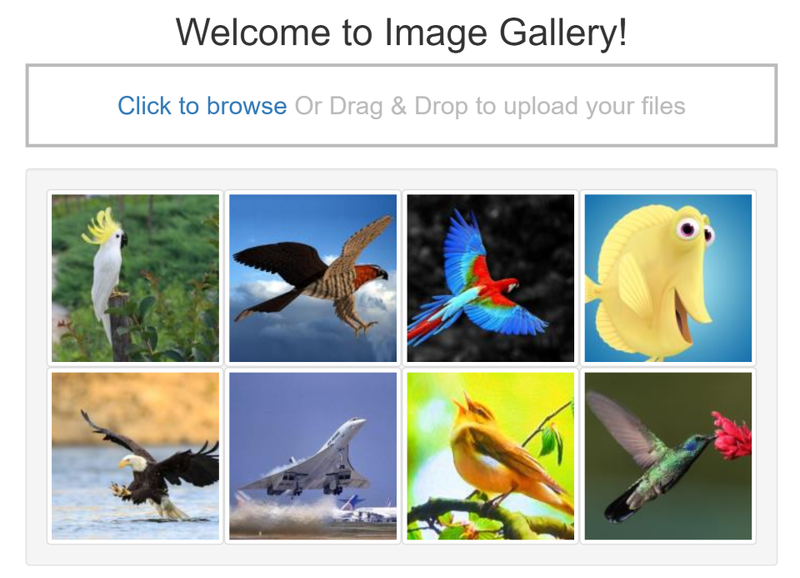 We will try to create an image gallery by uploading files and save data into database and images into a folder. We will try to create a component in a way that it can be used anywhere in entire application and configure properties like file size, type of files, single or multiple files, maximum number of files a user can upload at a time. 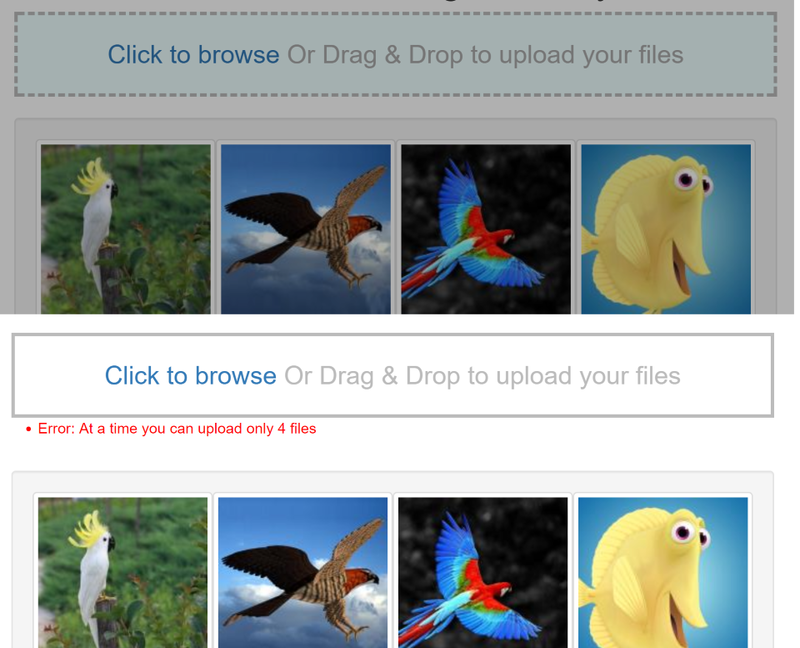 This the entire html to make a component to upload file by clicking and by drag and drop. Given a reference name to the input #file. On clicking the button we are calling the click event of input type file. See there is input type file which is used to open the browse file but set property display: none to hide it. [multiple]="(maxFiles > 1)": configurable, if max file to upload is more than one means user can upload multiple files otherwise only one file at a time. (change) = "onFileChange($event)": When user will click and browse and select a file, this method will be called to validate and upload the files. Next we used ngFor to show the list of error while uploading the file, it will show all the errors like max number of file allowed, file extension, file size etc. We imported here everything we need to use for drag and drop, input parameter, output to notify the user the status of upload and register different listeners for drag and drop. In constructor, we declare the object of our FileService to upload the file by using the Web API method which we will create latter. For now don't worry about the this.saveFiles method, we will add it latter in this article. onDragLeave: add this method to change the css class, it is called when goes out of the drag and drop area, so need to change the area to normal now. Note: In all our drag & drop events we use the preventDefault, it is important otherwise file will try to open in the browser. Before writing the service code in Angular, let's add Web API code first then we can come back and complete our service code. await SaveFiles(file, img): this is the method which save files two size 200 x 200 as thumbnail and 600 x 600 and save into a folder and finally save path and other detail into database. I will upload this Web API file on github so you can easily create your Web API method. As you can see here everything is configurable so this component can be used for any number of files, any size of file, any type of files. We use here refreshImages method to chech the upload status and refresh the images on the page. 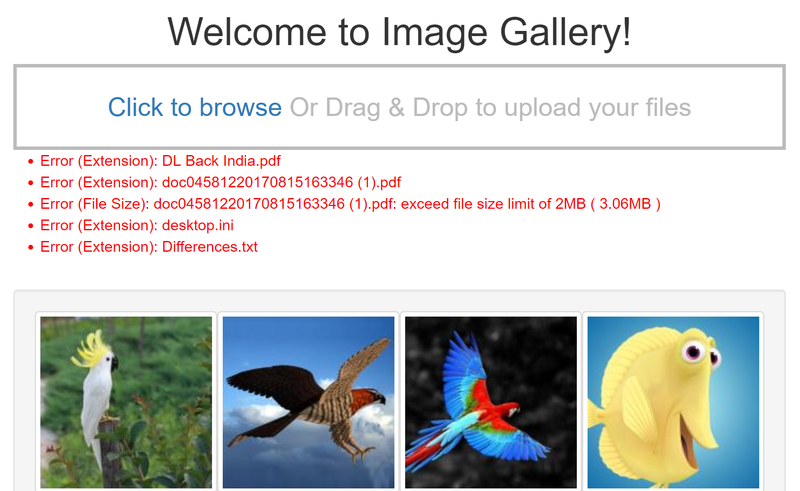 <img *ngFor="let img of images"
Just uploaded the src folder from my Image Gallery application to github - please download from there for more detail, also added complete Web API controller with name FileUploadController.cs, hope it will help to understand both part.